Odaiko Sonora has made taiko accessible to Tucson and Pima County residents since 2002. Through exciting performances, high-quality instruction, school residencies and team workshops we increase first-hand knowledge of taiko and the opportunities it presents for physical, mental, and spiritual growth throughout Southern Arizona. Our leadership, both administratively and artistically has been the responsibility of the two founders, Rome Hamner and Karen Falkenstrom. Since 2004, a volunteer Board of Directors has offered guidance and support. Numerous volunteers include performer/instructors and production staff, costume makers, merchandise and table staff, cooks, photographers, videographers, and, of course, the student players. We currently have one full-time staff person, a contracted Executive/Admin. Director, and contracted bookkeeper and facility coordinator. Our group culture is one of a semi-strict dojo, with centralized authority given to the leaders and designated senior players/instructors. The use of Japanese terms, knowledge of the history and traditions of taiko are emphasized, as are the concepts of ki, kata, rei and shoshin. Our group's stated principles are Sound, Mind, Body and Spirit. In addition to these, we stive to infuse the knowledge and discipline with a large dose of fun and fellowship. Beyond due respect for the art form and its traditions, our aspirations are community engagement, personal growth/well being, and artistic excellence. 3) An ongoing Community Group (CG) led by a Performer and designated senior CG player. The CG is all ages, and designed to challenge individuals and provide for their success. After one to three All Ages Recreational Taiko (AART) classes, students may request to join the CG. It meets each Saturday, 10am–noon. This group performs approximately five times a year. Each CG member pays a monthly dues and agrees to adhere to the group's guidelines. Student dues go towards studio maintenance, purchasing and maintaining equipment, and travel and hospitality costs for performances and master classes. CG members can stay for the Saturday PUP session if they seek greater challenge and opportunities for performing. From there, they may be invited to attend Wed. PEM/PUP sessions. And players who wish to pursue taiko performance as a serious life path may be invited to attend Friday PEM sessions. In addition to taiko instruction, Odaiko Sonora is committed to bringing taiko to Tucson residents and schools through performances, workshops and residencies. The group is also committed to raising the level of taiko instruction available in Arizona (and to nurturing the national and international field) by bringing numerous master teachers to Tucson. As a part of the southern AZ community, Odaiko Sonora is active with the Japan-America Society of Tucson, the Pan-Asian Community Alliance and the TUSD Asian Pacific American Studies Dept. We receive public funding from the Arizona Commission on the Arts and Tucson Pima Arts Council. Our private sector donors have included the Ralph L. Smith Foundation, Community Foundation for Southern Arizona, Target andToyota. But our mainstay for private, individual giving is the Friends of Odaiko Sonora, whose members pledge a monthly donation fo $10 to $100. The history of Odaiko Sonora's first five years is one of a passionate group, with a strong community service effort, working hard to bring a heritage-based art form to our region. 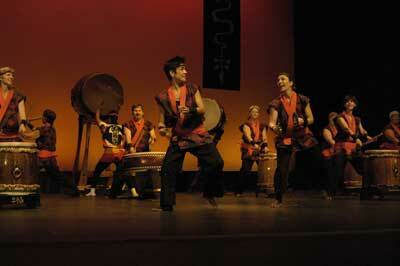 The group traces its roots to MoGan Daiko and sensei Stan Morgan. Mr. Morgan retired in 2002, and our founders, who had been playing with MoGan Daiko, launched Odaiko Sonora to keep taiko alive in southern Arizona. Those early days were marked by vital support from Phoenix's Fushicho Daiko ACA Roster Artist Esther Vandecar. Without their help in those early days, Odaiko Sonora would not exist. 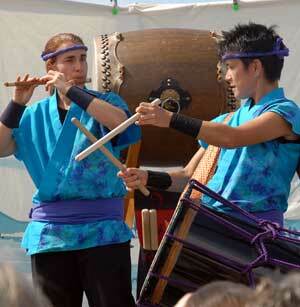 Odaiko Sonora's first performance took place in June 2002, and the group hasn't looked back. Constantly working to improve artistry, we have grown from that first session at Challenger Middle School to host our own self-produced concerts. Performance numbers have increased every year: FY 1011 saw over 50 performances, school residencies and other gigs. 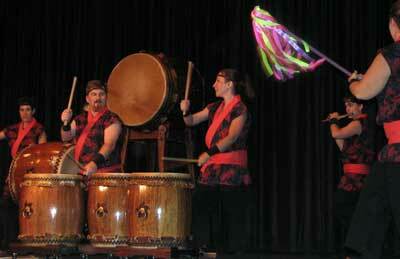 Odaiko Sonora's founders held significant administrative and non-profit organizational and arts experience, which supported the group's administrative development. Incorporated in 2004, we held our first formal Strategic Planning process in 2005. That first Strategic Plan laid out five goals for 2006-2009: secure a permanent home, hire a staff person, increase the number of self-produced events, create a teacher training track, and increase size and quality of the performing ensemble. Circumstances led to the achievement of that plan's ambitious goals in just 1.5 years. Since then, we've just been trying to keep up with ourselves! Other performing artists have recognized the energy and potential of taiko, leading to collaborations with modern dance, pyrotechnic circus arts, improv and other performing companies. Odaiko Sonora has always worked to provide consistently high quality taiko to the region, requiring that members train with master instructors. Members travel extensively to study, and the group brings master teachers to Tucson each year. Odaiko Sonora believes strongly in community service. We actively engagein outreach to underserved audiences through workshops, cultural exchange programs, and free concerts. We have, since our beginnings, donated performances free, or at greatly reduced cost, to benefits and fundraisers, including Relay for Life, the Pan-Asian Community Alliance and Tucson Chinese Cultural Center, Oasis Center for Sexual Assault, Parent Aid and others. We have participated in K-12 events such as Vail Pride Day and Drexel Arts Day, and provide school residencies for kids throughout southern Arizona. Also, since 2005, we have initiated several disaster relief events with other local arts and cultural groups.